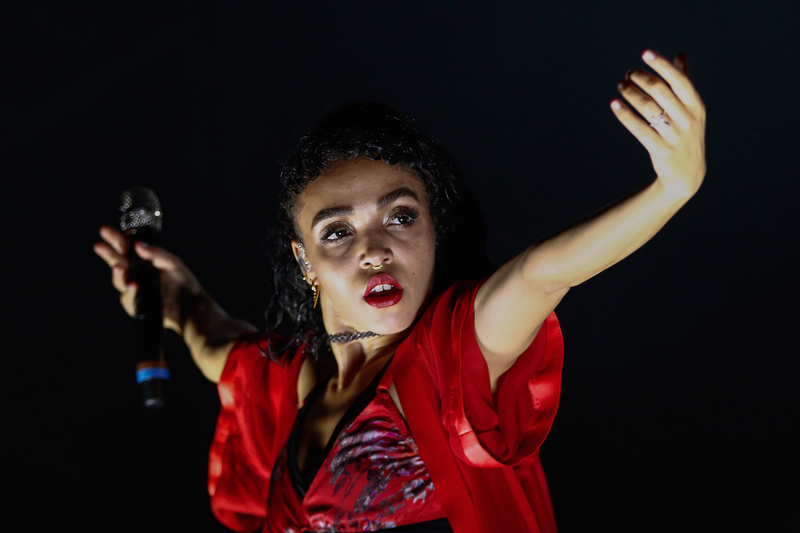 FKA Twigs, the British trip-hop songstress, has had an astronomical rise over the past year. She's gone from art house obscurity to the mainstage at Lollapalooza in the time it takes to construct a haute coutoure gown for the Met Gala. Though she's just finished a massive tour, it's no sign of her slowing down. In anticipation of her upcoming EP, FKA Twigs debuted a brand new single "Figure 8" on Beats 1 Radio on Monday and it's gloriously complex. Her signature hushed and smooth vocals crash over dark synths and twisted beats. According to the artist, the song is about meditation and finding oneself, but the sound is far more arresting than it is introspectve. Nevertheless, you can't help but be pulled in by it. That's the real artistry of FKA Twigs — the elements of her music sound like they shouldn't work together on paper, but when it's all put together it's a symphony. Albeit a confusing one, but a symphony no less. FKA Twigs works because she is unapologetic about her music, but is also somehow approachable. On stage and on the red carpet, FKA Twigs is a force. She's not bright, bubbly, or easy to place in a box. However, when she speaks in interviews or to her fans, she's charming, passionate, and thoughtful. FKAT Twigs proves once again with "Figure 8" that being a pop star doesn't mean being predictable. She's one of a handful of female pop stars who have rejected traditional trajectories and gone for a darker, grittier approach. The biggest breakout star of 2014 was Lorde, a teenager whose vocals are deep-toned and darkly colored. One of the biggest names in the game right now is Nicki Minaj and the songs she writes are far from safe — they're aggressively empowered. Beyoncé's last album was full of hardened tracks (think "Flawless" and "Haunted"), along with songs that touched on subjects like infidelity ("Jealous") and the pains of motherhood ("Superpower"). Even the princess of pop herself, Taylor Swift, has released a music video that's black and full of blood. Pop isn't about being sweet nowadays, and FKA Twigs is coming in at just the right moment. "Figure 8" will get stuck in your head — and not because its a Carly Rae Jepsen-like earworm — but because it's unique, it's dark, and it's hypnotic. FKA Twigs doesn't play by the rules in a time when "the rules" of pop music are becoming less predictable every single day. Take a listen to "Figure 8" and get transfixed by FKA Twigs.